If you are using Acronis Corporate product, see Acronis Corporate Products: Serial Number Is Not Accepted. The serial number is incorrect. Please enter the correct number. Make sure that you are using the correct installation file. It is recommended to register your serial number on Acronis website and download the necessary installation file. See Downloading an Installation File of Acronis Software. If you have several Acronis Home products, make sure you selected the correct serial number. (!) Acronis True Image Home 2011 and Acronis True Image 11 Home are different products and use different serial numbers. See Acronis True Image Home 2011 and Acronis True Image 11 Home. (!) Acronis True Image Home 2010 and Acronis True Image 10 Home are different products and use different serial numbers. 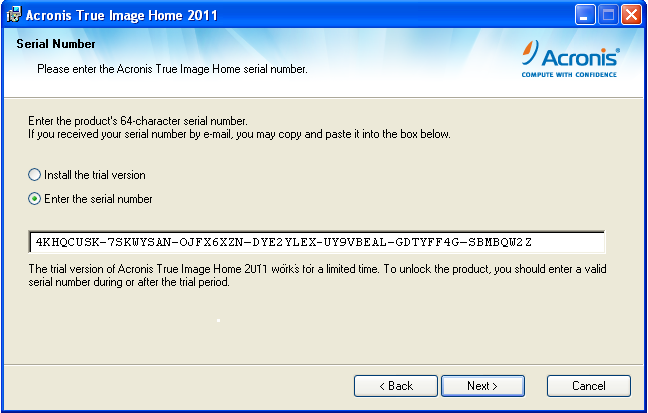 See Acronis True Image Home 2010 and Acronis True Image 10.0 Home. Make sure that language of the installation file matches the language of serial number. Make sure that you have a full serial number. Boxed versions of the product are sold with 16-symbol activation key that needs to be registered in order to obtain a full serial number. See Activating a Boxed Version of an Acronis Product. Make sure that there are no spaces before or after serial number when you type or paste it in the available field. 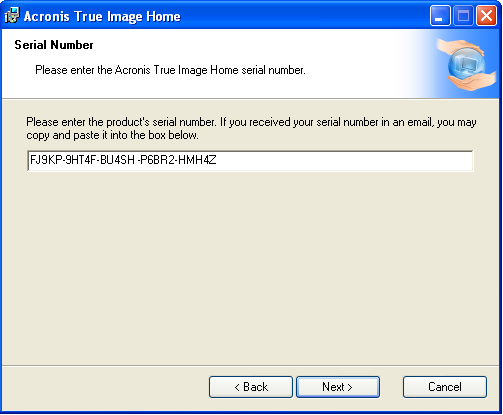 See also Pasting Serial Number in the Installation Wizard of Acronis Products. You specified a serial number for an Upgrade version of the product. In the second field please enter a serial number for an earlier version of Acronis product of the same product line (e.g. 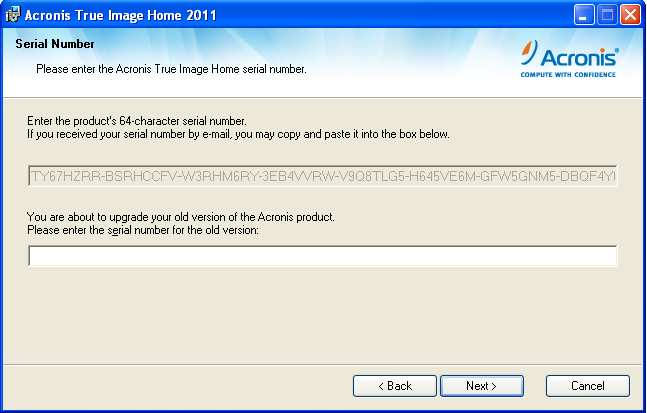 if you are installing Acronis True Image Home 2011, you should first enter the serial number for Acronis True Image Home 2011 Upgrade and then the serial number for Acronis True Image Home 2010). See also How to find the serial number of your Acronis product. (!) If an earlier version of Acronis product is already installed in your system, installation assistant will recognize serial number from the earlier version automatically and will not prompt you to enter a second serial number. (!) Acronis True Image 9.1/Echo Workstation is a corporate product and cannot be used as previous version for installing Acronis True Image Home and other products from Home & Home Office line. (!) Serial number and license key are the same thing in Acronis products.